This morning’s been so relaxing (almost 2 hours on trails in the park taking photos and renewing my soul), that I found myself at the grocery store when my alarm went off, indicating five minutes until the photo challenge theme would be posted. What was wrong with me? I wasn’t at home, hunched over my keyboard, ready to meet the challenge as quickly as possible! Heavens! That’s relaxation for you and just so you know, I didn’t even speed on the way home. Before I forget, the theme is “Intricate“, something found everywhere in nature and in the human body. Intricacy is one of the reasons I can’t believe in evolution. Not meaning to start any arguments, but to me, it beggars belief to believe that all these intricacies just happened to happen. Several years ago during a wonderful trip to Cape May, New Jersey, I went out one morning to walk in the fog. 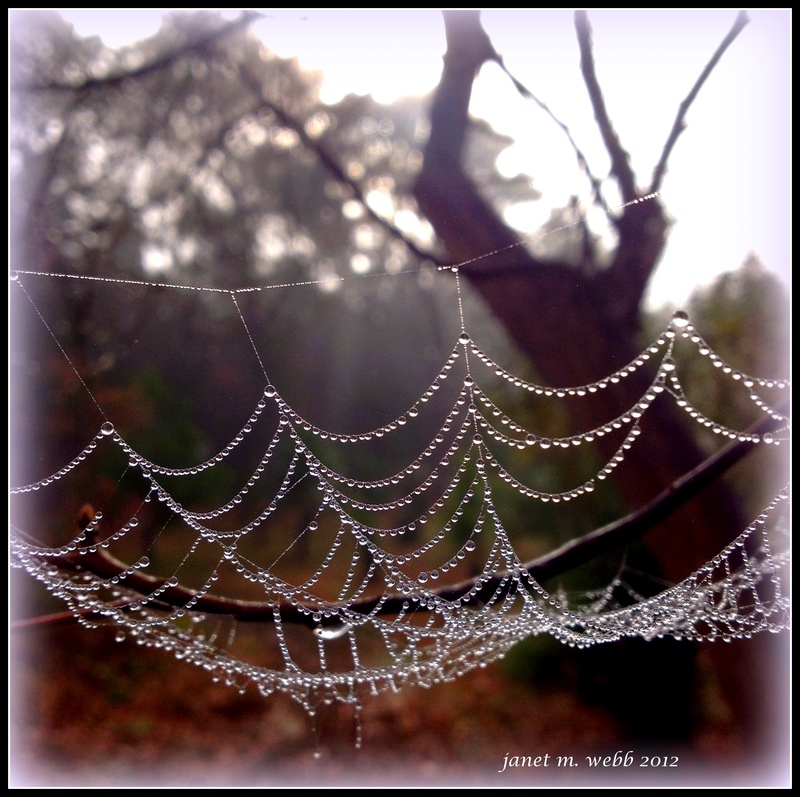 By sheer chance, I glanced to the side at just the right time to see this intricate bit of nature, enhanced by the fog drops. Soul food of the most filling kind! Spider webs are incredible in their intricacy. This is a gorgeous take for the challenge. Thanks, Angeline! I love photos of spider webs and am constantly taking them at the park when the light’s right. Thanks! Have a wonderful weekend. Thanks very much, K.Z. Hope all’s well with you. Thanks, Sandra. Are you barging yet? I’m reading a book about France and thought of you as well as my s-i-l.
Beautiful, Janet. I love the crystalline drops! Cathy, it took my breath away. If I hadn’t glanced to the side at just the right time, I would have missed it completely! That is just so beautiful, Janet! I’m very happy you liked it, Anita, and thanks for letting me know. Hope you’re having a great day and that the weekend is the same. We have a long weekend here. (so yay!) Wish you a wonderful weekend too. A long weekend? Hurrah! Enjoy. Thanks, Kathleen. I’m so glad you found time to stop by. Thanks for sharing your Friday with me. Happy Friday to you, Leya, and thanks. I’m glad, Amy. Enjoy your weekend! I really like the words leading up to your photo – and Cee has a web in her post too – but so cool how they both differ and have nice elements. In yours, I really like the back blue – it gives the web and its jeweled drops a nice base. Thanks for sharing your thoughts. Happy weekend. Beautiful. I did a similar shot last summer. I don’t really like spiders, but spider webs are just amazing. Janet, you spied a beauty, showing the intersection of nature and human nature. Happy Friday to you, Sally. This morning I enjoyed several hours of intersecting nature and human nature (mine.) Such a refreshing time! I would always opt to be in nature over technology. A trusty lens is excluded, which in some ways helps me see nature more fully. There are moments when I just must be–nature and me. Sounds as though that was your experience. This was a photo walk for me as well, as I’m usually walking for both exercise and to look around (and take some photos with my phone). But today I took my Nikon with the telephoto lens and my phone and went “off-road”, off the main trails and into the woods, by the river, etc. Got really close to a young buck and since he stood still looking back at me the entire time I stood there, I managed to get a few rather good photos. I have another area to walk in the next time I do this. Vielen dank (thanks in German, as I don’t know any Arabic. ) I like that word. You are learning much tonight (Qatar time) from the Irishman in the ME! Take care. You also. Enjoy the weekend. I’m happy you like it. The intricacies of nature never fail to amaze me. I love that you love it so much, Raewyn. 🙂 Thanks! Nice web, Webb, posted on your web. What a dazzling web! So is the headline. Intricate . . . Web Version. LOL. Wish I’d thought of that! And in my case, a web by Webb, even more fun. Thanks for visiting, Jann. I always enjoy seeing your photos. Wow that made me hoot out loud!! Suggest you retitle your post with all that, ASAP, Webb on the Web showing a Web! This is really great, Janet! Thanks very much, Andrew, and thanks for stopping by. Thanks! Maybe that’s on the same webpage. 😉 I like yours a lot too. I thought it looked like a necklace, too. I glad you liked it.